Being able to view an ancestor’s official death record is very important as a primary source in doing the family tree. Not only to have birth and death dates listed on the document, but person who provided information on the decease as well as what the person died of. The burial location, cemetery name, is usually provided and if there was a surviving spouse, that name would be listed. Another useful piece of information is the address of residence for the decease. Even parents’ names will be listed on a certificate. So having these documents available and free to examine is excellent. 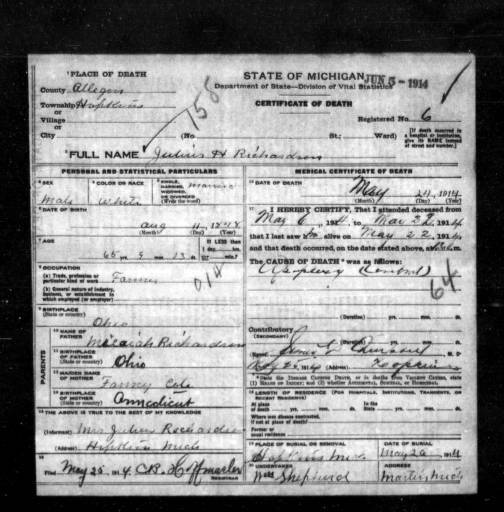 The dates covered for Michigan death records are in two sections. There is an index for the years 1867 to 1897. Next are the records covering 1897 to 1920. 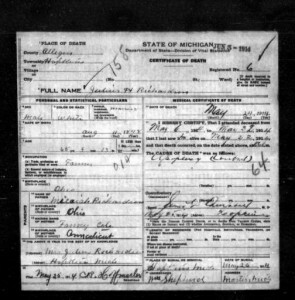 The newest additions are death certificates for 1921 to 1939, all free to examine and download to your computer. For the years 1940 to 1952 an index of the records will be made available in the coming months. Due to privacy restrictions it will be January 2016 when the actual certificate images will be made available. 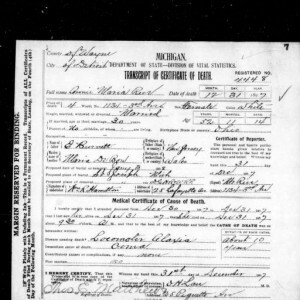 With the new additions there will be some 2.6 million death records for those who died in Michigan from 1867 to 1952. 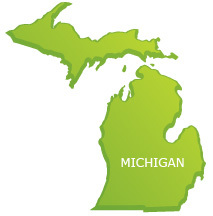 Reminder that you could have an ancestor who never lived any length of time in Michigan, but for whatever reason died in that state. So even if an ancestor lived in a nearby states such as Indiana, Illinois, Wisconsin and Ohio. A relative could have even come from Canada and could have died in Michigan. So check all possibilities. Photos: Annie Marie Rue 1846-1898 and Julius Richardson 1848-1914.